Here’s some brand new stuff that came out the week of December 16 that I think is worth a look-see for someone with little to no history with comics. That means you should be able to pick any of these up cold without having read anything else. So take a look and see if something doesn’t grab your fancy. If so, follow the publisher links or Amazon.com links to buy yourself a copy. Or, head to your local friendly comic book shop. Chimichanga, a story fit for youngsters! In Eric Powell’s first creator owned series since The Goon, he brings his off beat humor and unique style to comic readers of all ages! No, this is not a story about a fried Mexican delicacy! This is about a little bearded girl unfortunately called “beard bro” and her escapades with a slightly less than extraordinary traveling circus. Unfortunately I can’t find a preview of this, but if Eric Powell’s work on The Goon is any indication, this will be a weird delight. An ancient sentient entity is feasting on the very fabric of space and time. Only one man can stop it: The Engineer, last survivor of the destroyed Earth. Utilizing a colossal pipe organ that enables ‘pan-dimensional travel,’ The Engineer pursues the lost components of The Konstrukt, an archaic mechanism that imbues whoever possesses it with the ability to manipulate reality itself, in the hopes of using it to defeat the creature and undo the incalculable damage it has already done. Giant bat creatures, were-crabs, immense rock creatures, amorphous witches and armies of undead abound in this pulpy sci-fi romp for all ages! Collects and completes the ENGINEER series. Pretty good price for a hardcover collection this size. Another crazy ride that only comics can pull off. There are preview pages at the publisher link above. “All Speed. No Limits.” The end isn’t near… it’s here. America has become a wasteland, leaving the few cities that remain transformed into impenetrable fortresses. Beyond these walls lies The Zone, a brutal, plague-ravaged landscape stretching from one city to the next, populated by mutants, monsters, and warring factions of survivors driven insane by disease and starvation — only the very brave or the very foolish voluntarily step foot outside the protective confines of the mega-cities. NICK MASTERS just happens to be a little bit of both. Nick’s a driver, the best there is. If you need something picked-up, delivered, or disposed of, Nick’s your man. And he’s all business. But when he fails to deliver an important package to a local crime lord, Nick’s business suddenly becomes very personal. A science fiction action piece in the vein of MAD MAX from the writer of HEXED and FALL OF CTHULHU, Michael Alan Nelson, collaborating for the first time with EUREKA creator Andrew Cosby! Co-writer Michael Alan Nelson says on his blog, “if [you] like a little snark with your post-apocalyptic stories, this one is for you.” Here’s an 11-page preview. Following up on the success of The Complete Dracula, and Sherlock Holmes, Dynamite presents The Complete Alice In Wonderland. For the first time ever Lewis Carroll’s classics, Alice’s Adventures in Wonderland and Through the Looking-Glass with “The Wasp in a Wig,” the “lost chapter” (from the Looking-Glass) are adapted into one complete tale. In this All Ages adaptation, writers John Reppion and Leah Moore are joined by Erica Awano for a 4 issue adventure down the rabbit hole! This full color series features a massive 40 pages of story and art per issue, all under covers by John Cassaday, who supplies a unique die-cut design for the first issue that is sure to enthrall young and old. Moore and Reppion also provide bonus material such as script pages, annotations and samplings of the original text by Lewis Carroll. Great way to prepare for the coming movie. Love the art. Check out the 8-page preview at the publisher’s link above. The Complete Rocketeer saga is collected into one handsome hardcover volume for the very first time, combining The Rocketeer and The Rocketeer: Cliff’s New York Adventure into one great book. Dave Stevens’ classic adventure strip is set in the 1930s and is an homage to the classic pulp novels of the time. Cliff Secord is a stunt pilot who happens upon a top-secret experimental jet pack and meets adventure head on! Whether you’ve seen the 1991 movie or not, this is worth getting. The original source material was a comic book character that was sporadically published throughout the 1980s and ’90s. This is the first time it has ever been reprinted in one place. In addition to this $30 version, there’s also a fancier/more expensive ($75) Deluxe Edition, which is printed larger (8″ x 12″) and has an extra 100 pages of Dave Stevens’ pin-ups, sketches and other preliminary artwork. Here’s a look at the deluxe version at the blog of IDW editor-in-chief Chris Ryall. It’s the creepiest PTA Night ever when the lunch lady’s soup comes alive, the janitor turns into a werewolf, and the old graveyard that the school was built over brings the dead back to life! More humorous than frightening – a treat for kids of all ages! Silent double-page illustrations tell the tale of the Austintown Middle School on the eve of one of its monthly PTA meetings. At the beginning everything seems normal, with teachers and parents meeting in the auditorium, a janitor mopping the halls, a lunch lady cleaning the pots and pans from earlier in the day, etc. But things will quickly change, and the night will get very strange as the lunch lady’s soup comes alive and begins preparing lunch all on its own, a full moon shines through the clouds, turning the janitor into a werewolf, and a science fair project in the science lab makes contact with a UFO! The old graveyard that the school was built over brings the dead back to life, and the tenants make their way to the PTA meeting! Very cute and very fun book. Here’s a 4-page preview at Jeremy R. Scott’s blog. This has a very clever use of the comic page, where each 2-page spread is a bi-section of the school. As you make your way through the book, you see the amusing chaos break out in different rooms. I thought this was released by earlier this year, so I’m not sure why it’s popped up on the new release list again, or why the writer/artist Jeremy R. Scott only recently got copies himself to sell. So I’m not exactly sure what’s going on, but it looks like it’s out now, so go get it! You can also buy a signed copy straight from Jeremy R. Scott right here. And there’s also the great website PTAnight.com. A STOLEN INHERITANCE! ABDUCTION AT SEA! 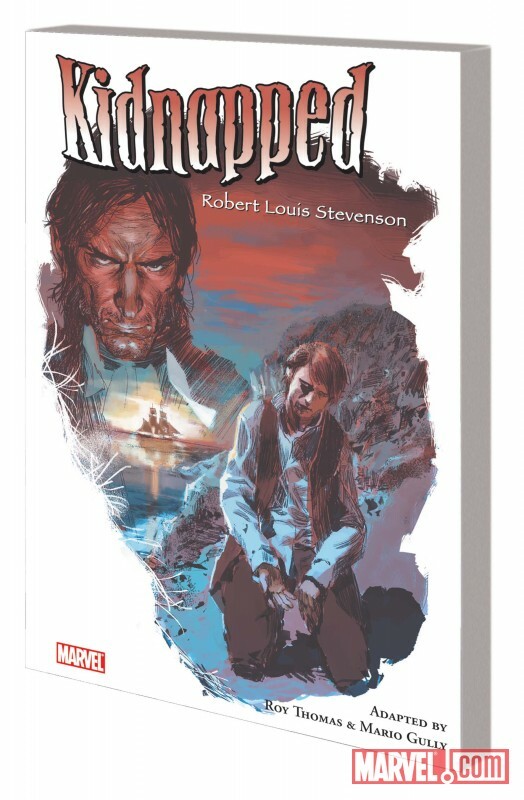 AN UNSOLVED MURDER: These are the elements that Robert Louis Stevenson, author of Treasure Island, wove together in Kidnapped, his novel set upon the ocean and in the wilds of the Scottish Highlands in the middle of the 18th century. Young David Balfour tries to claim his rightful inheritance from a treacherous uncle determined not to share it—and is kidnapped aboard a ship bound for the American colonies, where he’ll be delivered into slavery. He escapes in the company of a dynamic Scottish rebel named Alan Breck Stewart, and the two of them forge a powerful and memorable friendship—fighting all foes side by side, and triumphing in the end. Marvel Comics has been doing these classic novel adaptations for a few years now. I’ve never really heard much feedback on whether they’re any good, but I thought I’d point it out because I think it’s a good publishing program, in concept. Roy Thomas is an old Marvel warhorse. He was the first person that wasn’t Stan Lee to handle their characters on any significant level, and became Marvel’s editor-in-chief for much of the 1970s. Here’s a 6-page preview, which certainly seems decent enough. Here’s some brand new stuff that came out the week of September 16 that I think is worth a look-see for someone with little to no history with comics. That means you should be able to pick any of these up cold without having read anything else. So take a look and see if something doesn’t grab your fancy. If so, follow the publisher links or Amazon.com links to buy yourself a copy. Or, head to your local friendly comic book shop. Don’t have a lot of time, so not much commentary from me. Just imagine me being excited about all of these because they all look awesome. “My teddy bear’s a secret agent!” When a scientist succeeds in creating Artificial Intelligence, he discovers to his horror that the government plans on making it a weapon. On the run, he hides the program inside a mechanical toy bear. An unsuspecting family buys the toy bear and a little boy discovers a new best friend – a cute, cuddly toy bear who’s got all the moves of James Bond! Chaos, fun, and mayhem ensue, from the creator of EUREKA Andrew Cosby and EUREKA writer Johanna Stokes! Covers by MOUSE GUARD’s David Petersen. The covers alone crack me up. Here’s a preview of the first several pages. And here’s another preview of the third chapter. What would it be like to stand head and shoulders above everyone else — and to keep growing? Unable to interact with a fragile world that isn’t built to withstand your size? To live in a house that doesn’t fit you anymore — with a wife who doesn’t either? Craig Pressgang’s life is well documented in his official CIA biography, Giant Man: Pillar of America, but the heroic picture it paints is only half the story. The continuous growth caused by Craig’s strange medical condition brings a variety of problems as he becomes more isolated and unknowable. 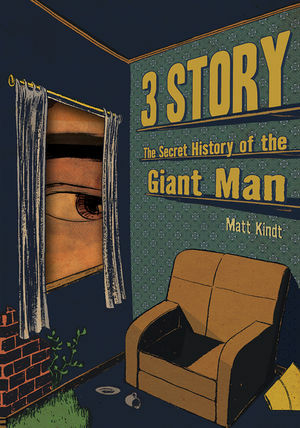 Told in three eras by three women with unique relationships with Craig, 3 Story follows his sad life from his birth to the present. Here’s a preview. Beautiful stuff. Also, here’s a the first of a 3-part interview with the writer/artist, which includes more images. When Senator Edward Kennedy declared, “Iraq is George Bush’s Vietnam,” everyone understood. The Vietnam War has become the touchstone for U.S. military misadventures—a war lost on the home front although never truly lost on the battlefront. During the pivotal decade of 1962 to 1972, U.S. involvement rose from a few hundred advisers to a fighting force of more than one million. This same period saw the greatest schism in American society since the Civil War, a generational divide pitting mothers and fathers against sons and daughters who protested the country’s ever-growing military involvement in Vietnam. Meanwhile, well-intentioned decisions in Washington became operational orders with tragic outcomes in the rice paddies, jungles, and villages of Southeast Asia. Through beautifully rendered artwork, The Vietnam War: A Graphic History depicts the course of the war from its initial expansion in the early 1960s through the evacuation of Saigon in 1975, and what transpired at home, from the antiwar movement and the assassinations of Robert Kennedy and Martin Luther King Jr. to the Watergate break-in and the resignation of a president. I couldn’t find any previews for this but from what I’ve heard it’s a solid objective overview of this period of American history. It’s bound to be more engaging than a text book. Schools would be wise to take a look at this one. Presenting one incredible collection of classic tales re-imagined by legendary horror artist Richard Corben. First, it’s Edgar Allan Poe as you’ve never seen him before. Classic Poe stories and poems are transformed into weird and disturbing new comic-book fantasies, with the original Poe texts printed alongside the new tales as an added bonus. It’s a frightening new presentation of Poe-inspired murder, madness and monstrosities! Then, Corben brings you a bold new interpretation full of eerie new spins on the poems and short stories of H.P. Lovecraft. Each adaptation is beautifully rendered in black and white with gray tones as only Corben can do it — along with a printing of the original source text by H.P. Lovecraft. Explicit Content. Creepy and macabre… just in time for Halloween. Here’s a review with some artwork.